Bhubaneswar:14/10/18: Odisha Chief Minister Naveen Patnaik, under whose stewardship the State would host the men’s hockey world cup on November, performed the role of hockey goalkeeper in his school days. 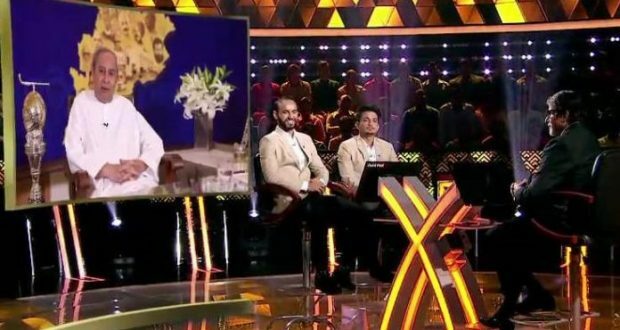 Patnaik, who featured in the Kaun Banega Crorepati’s ‘Karamveer’ episode telecast on Friday, said “I am an avid lover of Hockey. During childhood days, I played as a goalkeeper”. Replying to query by Big B, Amitabh Bachachan, Patnaik said” In Odisha, Hockey is a popular sport. It is very popular, particularly in our tribal areas, where they say the children by the time they learn to walk, then go on to playing hockey. I have played hockey as well,” he said. The State is hosting the Men’s Hockey World Cup tournament for the first time. The tournament will begin on November 28 and will continue till December 16 at the Kalinga stadium here.